One of modern China's most moving love stories can be read between the lines of Letters between Two, the correspondence between Lu Xun, China's greatest modern writer, and Xu Guangping, who lived with him from 1927 to the end of his life in 1936. 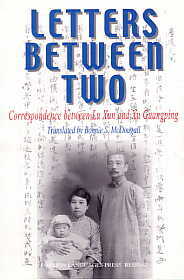 Dating from 1925 to 1929, the letters were edited by Lu Xun and first published in 1933. Readers can trace in them the gradual change in their relationship: from student and teacher, they become lovers uncertain of their future together, and then a couple expecting their first child. The letters also reveal their thoughts on literature, education, politics and their outlook on life.